Size: Mastacembelus armatus can reach a size of 35”. Origin: Mastacembelus armatus are native to East Asia. Feeding: Mastacembelus armatus are carnivorous. The tire track eel will accept live foods, such as blood worms, brine shrimp and worms. They can be trained to accept frozen food in time. Aquarium: The tire track eel (Mastacembelus armatus) inhabits well oxygenated water in the wild. So consider an extra power head or bubbles. Mastacembelus armatus can grow to large sizes. 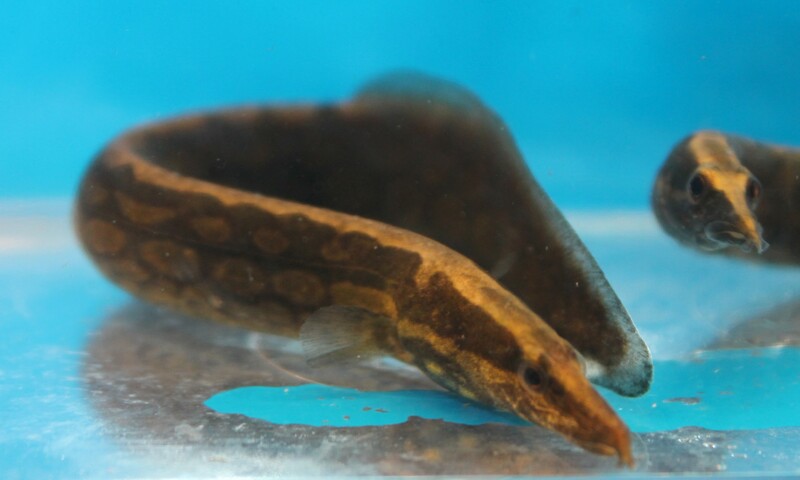 When planning an aquarium for the tire track eel, make sure the tank is large and the bottom is free from clutter, except for a few hiding places. They are nocturnal species, when feeding they should be fed at night. Small fish might possibly get eaten by Mastacembelus armatus so consider that when picking tank mates. The tire track eel does not due well with conspecifics. Breeding: Mastacembelus armatus has not been successfully bred in the aquarium. Normally they are egg depositors. And females tend to be rounder. Page displayed in: 2.4922 seconds.